Kibale Forest is approximately 296 square miles of lowland tropical rain forest, tropical deciduous forest, marshes, grasslands and crater lakes, and is the best place in Uganda for chimpanzee trekking. Kibale is also home to ten other species of primates, including black-and-white colobus monkey, red colobus, gray-cheeked mangabey and red-tailed monkey. Other wildlife includes blue duiker, Harvey’s red duiker, bushbuck, bushpig and over 100 species of butterflies. This park is also excellent for birding. An early start to meet your guide and enter the forest in search of chimpanzees and ten other primate species including red colobus monkey, blues, red tails and grey-cheeked mangabey. Overnight Ndali Lodge or Kyaninga Lodge. Drive to Fort Portal and continue by Queen Elizabeth National Park following the Ruwenzori Mountain Range. Continue to Bwindi arriving late this afternoon. The Bwindi Impenetrable Forest is an unremitting belt of montane forest that is the home to mountain gorillas and other rare primates.3 nights Gorilla Forest Camp. Bwindi is a forest of enormous hardwood trees, giant ferns, tangled undergrowth and hanging vines - the quintessential equatorial jungle. The size and altitudinal range of montane and lowland forests at Bwindi support more species of trees, ferns, birds and butterflies than any other forest in East Africa. It is also the only one which contains both chimpanzees and gorillas. 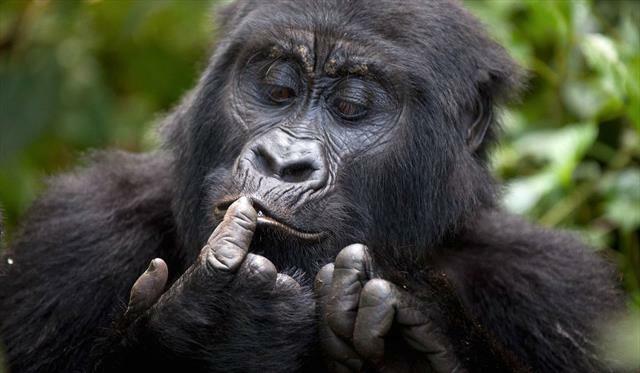 This morning you will depart on your first gorilla trek taking a picnic lunch with you with 6 trekkers total plus your guides, armed rangers and any porters that you hire to carry your backpacks. Overnight Gorilla Forest Camp. Drive to Mbarara, passing through the Switzerland of East Africa and eventually into Ankole Cattle country around Mbarara. These cattle are incredible, with enormous horns. If time permits, visit the local market, where everything imaginable is on sale. Continue to Lake Mburo and your lodge.